What mortgage is best for you? It is not possible to answer that question without knowing your personal details. However, here are some of the more common types of mortgage, and each should be available to most people. 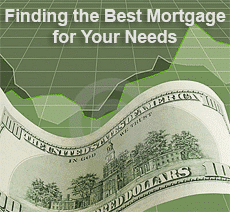 A fixed rate mortgage is the most common type of mortgage loan in the USA. The interest is set at a fixed rate for the duration of the loan, which is commonly 15 or 30 years. The loan is amortized so that you will be paying exactly the same each month. Since the interest is serviced first, the bulk of your payment will initially be applied to the interest, the remainder being deducted from the principal. Since the principal reduces slowly to begin with, so will the monthly interest due on it. Towards the end of the mortgage loan period, interest will be less because the principal has dropped, so the bulk of your payment will be used to reduce the loan. This type of mortgage is popular with many people because they know exactly what their mortgage will cost them each month. Because it never changes, it becomes less of a proportion of their income as they earn more. If you want security against future interest rate hikes then this might be your best choice. You must also understand that the cost of this security is that you would not benefit if rates dropped. Assuming you are willing to take your chances on mortgage rate fluctuations, what mortgage is best for you then? Again, no definitive advice can be given in general terms. One option is the adjustable rate mortgage (ARM). With adjustable rate mortgages, the rate will be fixed for an initial period, after which it may fluctuate according to an interest rate index. An ARM will involve an initial rate, which runs for the initial period – 5 years for example. After that it will change at intervals specified in the loan contract. The amount of change will be to the index used plus an additional margin. If the MTA index + 2.5% is used, the 12-month Treasury Average Index rate will be used plus an additional 2.5%. There may be a rate adjustment cap, which states the maximum by which the rate can be increased at any interval. This helps to avoid extreme increases in monthly repayments. A maximum rate will also be stated, above which it cannot be increased. There are many different arrangements possible for adjustable rate mortgages which is why they can be confusing. With interest-only mortgages, the monthly payment covers only the interest. The principal is paid as a lump sum at the end of the period. You should not consider interest-only mortgages unless you are sure you will have that lump sum at the appropriate time. This might be from a lump sum pension payment, a maturing endowment policy or some other cast-iron source. If you cannot pay you will lose your home. Interest-only mortgages can be useful if you intend to live in your property for only a short period of time, build up some equity and then sell it. Balloon mortgages are part-way between interest only and regular mortgages. You agree to pay a certain sum as a balloon payment at the end of the mortgage period, the rest of the principal being amortized as normal. You don’t benefit a great deal at the beginning, because most of your monthly repayment is used for interest. However, if you intend selling up after a period, the equity should pay for the balloon. What mortgage is best if you have a low credit score? The Federal Housing Administration does not offer mortgage loans itself, but will insure a mortgage provided by a regular lender. While that lender would not offer you a mortgage personally, the FHA enables them to do so by underwriting the loan. That means that the lender will be paid by the FHA if you default on your repayments. There are conditions attached to FHA loans, and they are not as easy to get as they once were. However, if you are a first-time buyer, you may be able to get a mortgage with a down payment as low as 3.5% if your FICO score is 660 or over. You can also get a loan with a FICO score of 580, though lenders tend to be looking for at least 620 and 10% down. The above are the more common types of mortgage, but what mortgage is best for you will depend on your circumstances. If you are a veteran and having trouble getting a FHA mortgage, you may qualify for a VA loan. There are mortgage types and hybrids between various different forms of mortgage. We can give you free advice on the best mortgage for your circumstances in addition the latest updates on the mortgage market and mortgages rates.